With the goal of accepting only the most qualified students, Boston University (BU) knows the importance of taking a close, holistic view at each student's application. Unfortunately, with tens of thousands of applicants every year, getting that complete picture wasn't easy – especially with the Admissions department relying completely on paper. With OnBase, all the documents required by Admissions are captured and stored in one electronic location, making information easier to find. Switching to an electronic format allows multiple staff members to view and work on student files simultaneously. Any changes made to the files occur immediately within the solution, so everyone is always working with the most up-to-date information. 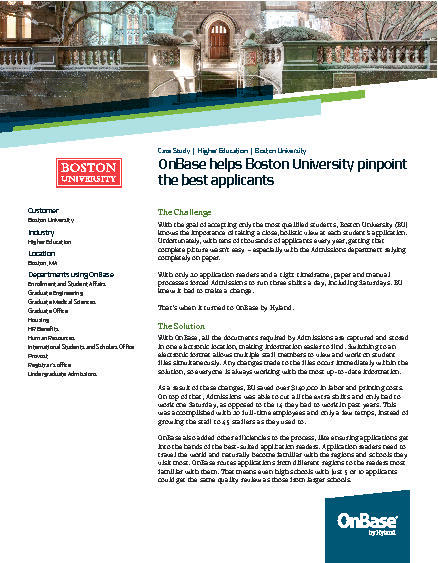 Read the Case Study to learn more about the departments that deployed OnBase and the difference–including cost savings–that OnBase made at Boston University.